In 2015, the big innovation in drones was "follow-me" mode. It wasn't new, but the technology was finally good enough for it to become a leading feature in quadcopters. A few did just that, most notably AirDog, Lily, 3DR, DJI and Hexo+. In 2017, Lily is bust, 3DR had to pivot to enterprise and Hexo+ has been "out of stock" on its website for months. DJI was already the biggest player in the game back then. 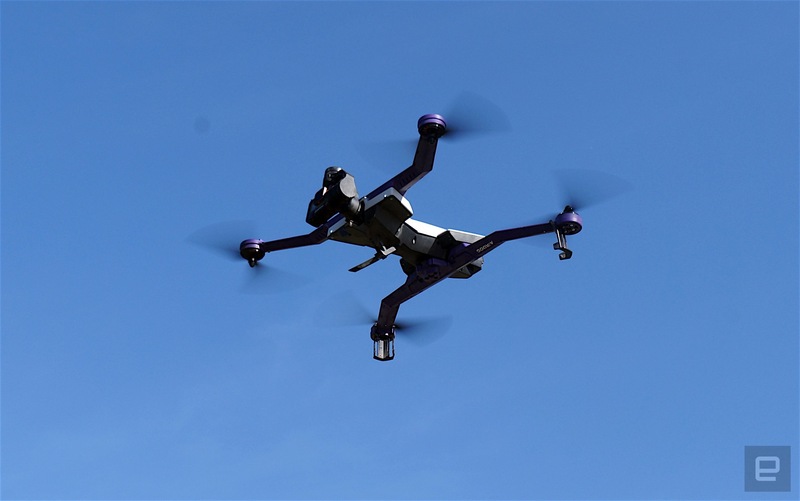 The small, indie team at AirDog, on the other hand, is alive and well, and back with a new drone -- the ADII -- which takes the follow-me feature to (literal) new heights. If you think the drone in the picture above looks remarkably familiar, that's because the design itself is nearly identical to the original. Though there is one clear difference: the color. Out is the "it'll grow on you" mustard yellow, and in is a new, cleaner off-white (the purple arms remain). Most of what's new is found under the hood or in the app. While the original AirDog was pretty good at following you, that's more or less all it could do. You could adjust its position in the air manually with the wearable "airleash" controller, but nothing like the level of control you'd get with ... well, a controller. ADII goes a decent way to change this with a feature called "3D Lines" (more on this in a bit) and scenic modes -- now you can get your establishing shots, hands-free, all with the same drone. Two years ago, controlling a drone with basically a large watch (which is what airleash looks like) felt like an exercise in faith. You'd better hope there are no cables/trees/pedestrians around the corner, as you likely won't have time to do much about the drone following you in hot pursuit. With ADII, you can create "lines" in the companion app (iOS and Android) ahead of time. Preset flight paths aren't all that new, but the way AirDog has implemented them makes them especially useful. In the app, you can pull up a map and start setting waypoints. Dragging these around allows you to create elaborate shots that move away from you or zig-zagging across your path. You can also use them to avoid buildings, hills and trees (just hope none have grown since the last time satellite view was updated). The "3D" component comes from the ability to also determine the drone's height at any point along those lines. This serves the same dual-purpose of creativity (as the drone goes up, the camera stays fixed on you) and practical object avoidance. The AirDog app will also show you ground topology so you can see the hills and dips on your route and adjust the flight path accordingly. Once your line is set, ADII will stick to it like glue, and only move forward or backward along that path as you progress along it. 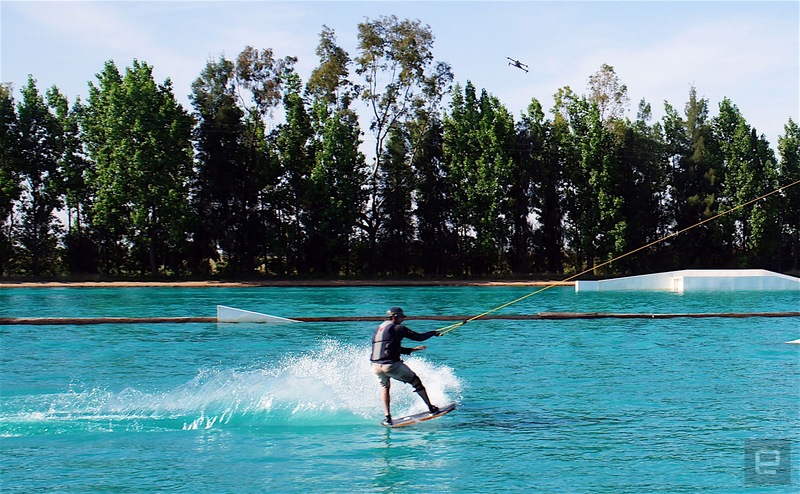 I got to see it in action behind the scenes at AirDog's promo video shoot at a cable wakeboarding park, which is pretty much the perfect use case. ADII was able to fly around the park well away from any wires while still pulling off creative maneuvers around the track. It also means you can fly in places that wouldn't have been advisable before, through narrower canyons or roads with lots of switchbacks. With ADII, AirDog is trying to turn the anxiety of not having a controller in your hands into a feature. Flying with a regular radio controller is fun but passive. With ADII, the goal is to have you embrace being in the moment without worrying about your drone. DJI tried to do this with Spark, but it's more of an add-on feature, and it shows (as I recently found out). If you do want to get more hands-on with the flight, the updated airleash comes with more controls (via long press of buttons) that can activate orbit modes or continuous (rather than incremental) movement in all directions. You don't have to use 3D lines, though. You can still have ADII follow you in three different modes without following a track. There are also sport-specific modes that optimize settings for, say, trail running or surfing (the drone isn't waterproof, but the leash is). Other updates include the ability to control your Hero5 (the only compatible camera at this time) directly, so you don't need to remember to start recording (we've all forgotten at some point). The airleash also has a backlit screen, which sounds minor, but will elicit a gentle ripple of applause from owners of the original model. The batteries now show the power indicator at all times too (before they were on the part of the battery that ended up inside the drone). Flight time is estimated at 20 minutes under optimum conditions, less if you tear around at ADII's top speed of 40mph. Watching the AirDog team (a speck of a company compared to DJI) work at the waterpark, it's clear that they really wanted to make a product for themselves. As cliche as that is, it's something you don't get to see first-hand too often. Being a smaller company does have obvious downsides, though—resources, for one, which is likely why we didn't get a slick redesign this time around (though the Phantom still looks much like it always did, to be fair). Being small also means things take longer. Two years isn't a slow pace in product development, but no doubt many would have liked to see some onboard obstacle-avoidance or improved landing gear (it's the same clip-on feet from before, which aren't the sturdiest). Still, at least AirDog is still in the game, which is more than can be said for others, and it's clearly keen to own this space (making my suggestion from last year to potentially still be valid). 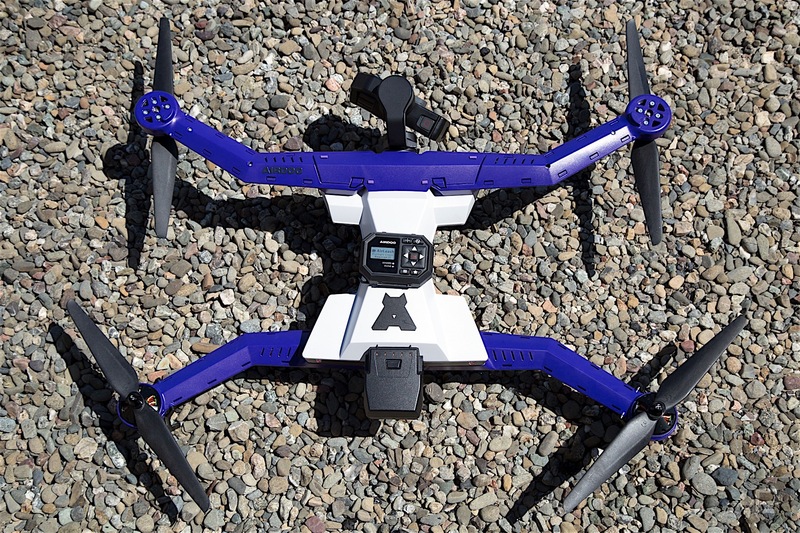 The ADII launches on Kickstarter today and will cost $999 for the earliest of birds. Prices ratchet up $100 per tier as each sells out, with the end retail price being $1,500. That price is somewhat steeper than, say, the fully-featured Mavic Pro, or the Karma (even with a new GoPro), so AirDog's biggest challenge will be convincing the action-sports crowd that ADII's singular focus is worth the extra investment. Any self-respecting shredder knows that the perfect shot is priceless, though, right? We have an early model here, which we're testing right now, and AirDog seems to have production already underway -- so there's a solid chance backers won't have to wait anywhere near as long as last time.